Today my mother and I decided to drive to the country to visit my grandparents. There is nothing I love more than getting out of the city on a beautiful summer day, since there is always something new to discover this time of year. 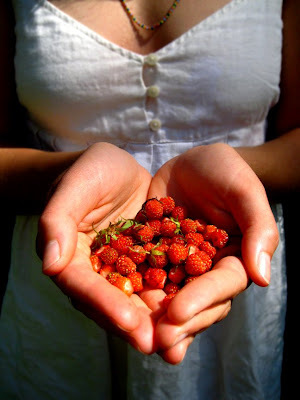 During a walk, I came across a patch of wild strawberries and promptly plunked myself down in the bush to devour all the little gems that I wait all winter for. Real strawberries, whether wild or from a farm, are rather small, bright red and soft – so delicate that they almost melt on the roof of your mouth, no teeth required. They are rich, fragrant and incredibly sweet. In case you haven’t noticed, fresh, locally grown strawberries have been trying to squeeze their way into big box grocery stores for the past week or so. The problem is we’ve been so “spoiled” by those gargantuan, hard, tasteless, nutrition-less freaks from California that we have forgotten all about the real deal. I guess we are just in the habit of supporting our southerly neighbors, since it couldn’t possibly be because we prefer the flavour! In Ontario, strawberry farmers are now struggling to survive as we continue to buy produce form foreign countries. Some cannot even afford to pay workers to pick their berries, as the labour alone ends up costing them more per pint than the Californians get at wholesale. Many grocery stores have yearlong contracts with their foreign suppliers and cannot be bothered to buy local produce and pay the often-higher prices. 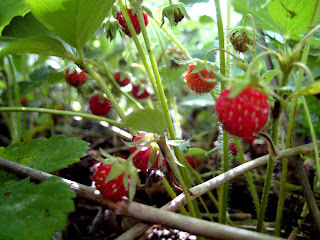 According to the Greenbelt Foundation, there was an 18-per-cent decline in Ontario’s strawberry acreage from 2003 to 2005. We produce a humble six million kilograms of strawberries to California’s one billion kilograms each year. Be responsible! Buy local and support your provincial farmers and your taste buds. If you have the privilege of finding wild strawberries, make sure that they have not been sprayed and that they are not near a road where dust and exhaust are being thrown at them. They will be very small indeed, about the size of a fingernail, but don’t be fooled by their modest magnitude; these little ones pack a huge punch – far greater than their American counterparts. 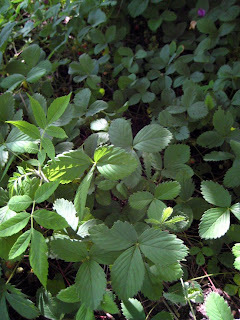 Since strawberries like to hide underneath their leaves, they are often hard to spot. Look for leaves that come in threes, growing very close to the ground (see photo). If you pull back the foliage, you will see some tiny red berries that just want to find a home (in your stomach). It’s almost like treasure hunting, but more fun since you get to eat your jewels! That’s pretty cool, Sarah. When I was in BC, I took a day and got lost in Stanley Park. After a while I ended up hanging out n the forest eating wild salmonberries. There’s something really special about eating berries you pick yourself.